At times the painting of Lorenzo Veneziano is charged with gentle naturalism, as in this 'Marriage of St. Catherine'. 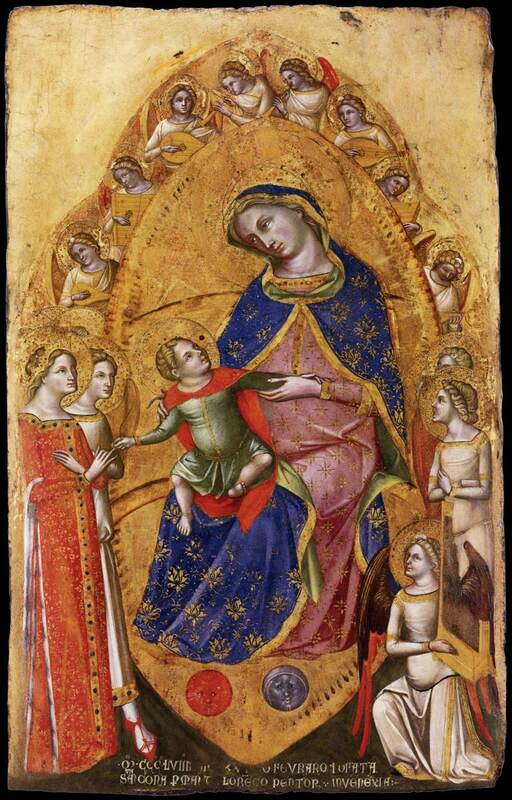 The way the Virgin holds Her Son as He almost slips from Her knee to place the ring on the finger of St Catherine is finely observed and rendered, while the angels, all intent on playing their musical instruments, seem to go beyond the limits of the picture itself. The fluid handling of movement is very reminiscent of the impetuous gothicism of Vitale di Bologna, while the soft, gentle range of colours and the careful attention to detail in the figures of St Catherine and her companion recall the tender realism of Tommaso da Modena. It is signed and dated 2nd. February, 1359 (more Veneto).